"My parents were both from farms in rural Idaho, so when they moved to Richland, Washington, (my home town), and had me and my two sisters, they made sure that we were taken to every single cultural event that came along. We got to go to plays, ballets, art-shows and concerts, while at home we were fed a steady diet of Broadway shows and country western music. One of those concerts was a woman playing solo cello. My mother declared the instrument to be un-lady-like, and I was immediately smitten. In those days, one was required to take two years of piano before starting a string instrument, so it wasn't until the third grade that I began, but my first experience of playing in an orchestra made me realize that this was what I wanted to do. I had started lessons in the public school, and didn't start with a private teacher till the next year, who scared the life out of me by telling me that everything I was doing was wrong! I think playing the cello, and being involved with making music, is the most wonderful thing to do in this universe, and that is what I try to convey to my students. It is an instrument that requires a lot of time and concentration, but one is repaid a thousand times over for the effort. I love teaching the cello. I feel that I am there to help my students gain a sense of fun and accomplishment that goes with working on making a piece sound both beautiful and musical. 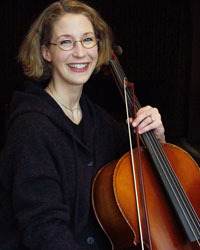 My top influences have been my teacher, George Neikrug, and all the wonderful cellists out there."